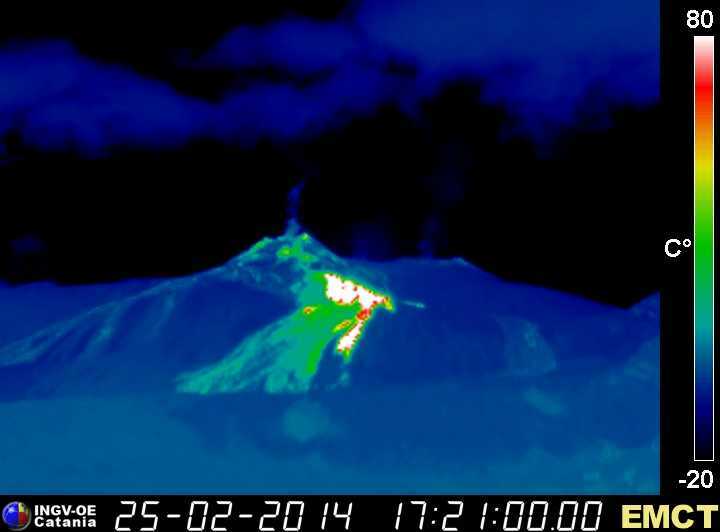 Etna (Sicily, Italy): Mild strombolian activity from the New SE crater and weekly alimented lava effusion from the fissure vents at its eastern base continue. Marsili Seamount (Tyrrhenian Sea, Italy): A recently published study shows that submarine explosive eruptions have occurred at the underwater volcano in historical times. Therefore, the volcano should be included as one of Italy's still active volcanoes. Kelud (East Java): An areal photo from 23 Feb shows no signs of a new lava dome, at least not near the surface of the new crater. Ibu (Halmahera, Indonesia): A thermal anomaly remains visible at the volcano on satellite data, suggesting that there is some sort of ongoing eruptive activity. This could likely be from a slowly growing lava dome. Kilauea (Hawai'i): (24 Feb) The Kahauale`a 2 lava flow reached 7.8 km (4.8 mi) northeast of Pu`u `O`o by mid-January before stalling. Recent surface flows have been active as small scattered breakouts behind the flow front. Pacaya (Guatemala): Mild strombolian activity continues at the Mackenney crater. INSIVUMEH reports ejections of fine-grained tephra (ash) to 100-150 m above the crater. Tungurahua (Ecuador): Activity continues an overall decreasing trend. The volcano has occasional explosions and ash emissions, typically 4-5 per day, which cause light ash fall, mostly in Pillate, Tisaleo and El Manzano to the S and SW. In between such emissions, the volcano is calm. Seismic activity is still significant, but also seems to be decreasing, the latest IGPEN report mentions. It also writes that the scenario of a return to more elevated activity in the near future (days to weeks) is less likely than a continued trend towards calm. A significant hazard for the valleys radiating from the volcano remain lahars, as the expected heavy rainfalls in the coming weeks can remobilize the significant amounts of fresh loose deposits and turn onto dangerous mudflows (lahars).